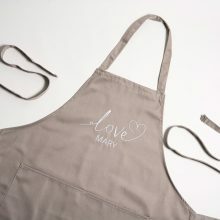 If your loved one has a passion for cooking, then treat them to their very own personalised apron this Valentine’s Day! The detailed design features the word “Love” and a name of your choice to be embroidered below. This is available for order at GettingPersonal.co.uk for only £14.99, and everything is 10% off now with code JAN10. They have a wide a selection of personalised Valentine’s Day gifts – explore here. Get your order shipped to our UK warehouse to save from paying international shipping fee!